What does teamwork have to do with ROI? You probably know what it’s like to work on a “team” that isn’t aligned…confusion, missed deadlines, interpersonal squabbles, turf issues, politics, exiting of good workers…and on and on. You may even be on one of those teams now. Maybe you are the leader of one of these teams! The business pages are filled with stories of companies that fail because of internal strife. Loss of talent, low morale, and poor performance are EXPENSIVE. In today’s complex workplace, no one person can have all the answers or be able to do everything that needs to be done. That’s why most work is done in teams…intact and increasingly virtual…and even global. Some team members never even see their colleagues. And yet they are expected to get work done efficiently and effectively. 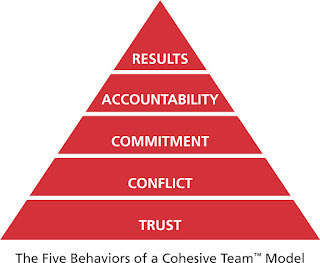 Why invest in building cohesive teams? Best-selling business author Patrick Lencioni calls teamwork “the best competitive advantage that any group can have.” He points out that good teamwork is simple…but not easy. It takes a lot of work over time. And it takes courage. You can hear more about teamwork from Pat here. The simplicity of teamwork are the elements that result in aligned action. It’s the process of assessing the team’s strengths and skills that require objectivity and leadership. Leaders must then be committed and courageous to model the new behaviors and foster a culture of trust and accountability to allow people to take risks, tell the truth, and even “fail” so that everyone can learn and improve. Want to learn more about ways to equip your team to get better results? Attend an upcoming Five Behaviors of a Cohesive Team Breakfast Showcase* and hear case studies of companies that have improved performance and gained ROI using the process and tools we can provide. View the schedule here. * Please be our guest at an upcoming Breakfast Showcase at a city near you. Feel free to bring a colleague or two. Just call 413.522.0811 or email info@DiscoverLiA.com to register. Please register at least 5 days prior to the event.